The law is an adversarial system. Meaning there are winners and losers. 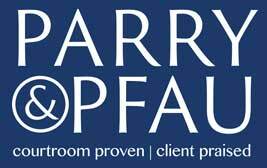 At Parry & Pfau, we're like everyone else—we love winning. It's not all about winning (that's a hackneyed thing to say, but it's true), and we don't always win, but we have a really good record. Every time we bring home the win for our clients, though, the other side walks home disappointed. I imagine they must feel powerless. Maybe they start feeling bitter about the justice system. Most of them live with their disappointment. They move on. Others can't help themselves, though. They want to lash out in any way they can. Some of them file bankruptcy—figuring they'd rather lose all their money and credit than let us get any of it. Others post on social media or leave reviews on Yelp or Google. One of them actually set up a website dedicated to defaming me. I had an arbitration against Gary Lindsey in 2011. He filed an insurance claim when his house was damaged. The insurance hired my client, a contractor, to fix the damage. They did so. 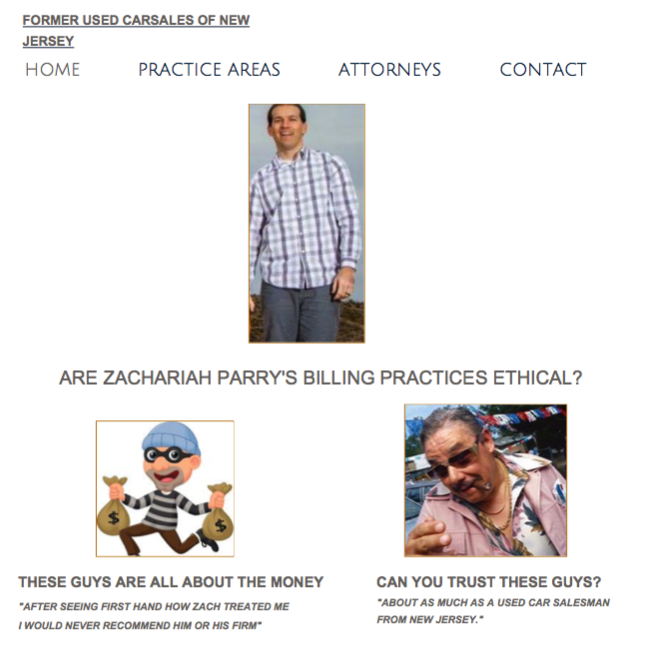 The insurance company gave Gary the check and asked him to pay the contractor. He kept the money. We sued. I'm just now heading into an arbitration against this firm. They took over a lien against my home from a fraudulent contractor who overbilled, did shoddy work, did not do many items on the list of things that they were required to do, and did work out of the scope of the contract without prior authorization (which the contract clearly and explicitly requires). Correct me if I'm wrong but shouldn't they have read the contract before agreeing to file the lien against my home for the contractor in the first place? If I were looking for an attorney I would probably start with one that can and will read the contract before taking the case. We got $86,000 at arbitration, including our attorney's fees. I represented a special master appointed by a family court judge to help facilitate discussion between parents in a high-conflict custody case. Carline Von Gardner was the mother. She did not pay my client her portion of the bills, and so we got a judgment against her for $14,000. Unfortunately, that was our first Yelp post. So it looked like we were a one-star firm (our firm was new at the time). We took her to court to get it removed. She ended up having to admit in open court it was her (she posted under an alias), removing the post, and we have a $35,000 suspended judgment against her that we can collect if she ever says anything (good or bad) about our firm or any of its members again. Yikes. We represented a client in a case where Robert Lauer offered to purchase my client's home in a short-sale. My client agreed, and Robert Lauer moved in pending the acceptance of the offer by the lender. The lender rejected the offer. Robert Lauer refused to move out, claiming that the home was his. 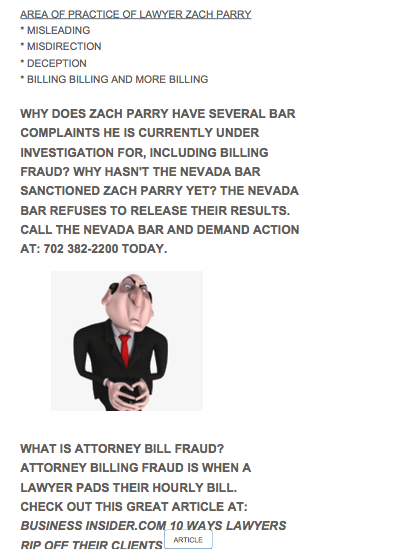 He then sued my client for fraud when my client tried to evict him. We filed a motion to dismiss the fraud claim and a request for fees and costs. The court threw out the complaint and awarded about $5,000 in fees and costs. Then Robert Lauer filed a bar complaint against me alleging that I charged too much in fees. It got thrown out. Then he filed another motion with the court asking them to reconsider the fee award. The court did reconsider it. And added another $1,200. To round off our victory, the eviction court also awarded fees. $750. My client was a young father and husband. Nicole Eisman was a stalker. She incessantly contacted my client through Facebook and Instagram, email, text, What's App, and phone calls. He blacklisted her on social media sites, wrote her letters asking her to leave him alone. She didn't get the hint and even traveled over 1,000 miles to catch him off guard at the Vegas Comic-Con convention. She would not leave him alone. I wrote a strongly worded cease and desist letter. It worked. She ceased and desisted and left my client in peace. I received a highly inappropriate, and very ill written, immature letter from Zach. He lost all sight of professionalism when he did a family member a favor in writing this preposterous cease and desist letter when I had a relationship with what I believed to be, his family members [sic] estranged husband. Hurt feelings and dramatic letters ensued. He ended his subpar letter with the statement, "If you want to know how serious things could get for you, look me up." I did, and I have to say, you come up lacking. Severely. I would highly suggest hiring a different lawyer, one that is not so preoccupied with his own families [sic] drama and antics. My letter, inappropriate, ill written, immature, and subpar as it might have come across, did the trick. This kind of stuff used to bother me, but I realized that if I am the target of the abuse from crazies, my clients are spared. And that's a good feeling. Newer PostIs it Legal to be Asked About Salary History in a Job Interview?